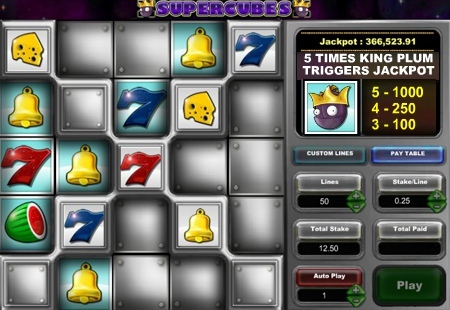 Super Cubes is a 5 reel, 50 payline slot machine game with wild symbol and progressive jackpot. Select your wager with coins from 0.05 up to 5.00 credits. If you activate all 50 paylines, you'll be betting up to $250.00 per spin! The higher your stake, the higher your winnings - win up to 500,000.00 per spin! Top base game jackpot is 1,000x line bet for 5 King Plum symbols. Wild: The Wild 'Green 7' symbol substitutes for any symbol to form winning combinations. It has no separate payouts. 5 King Plum symbols trigger the progressive jackpot. You can win growing jackpot with any paid spin. Bet all 50 lines with suitable coins in order to increase your chances of winning.